There are some foods I just don't like. There are others I don't want to like, and there are some that I just thought I didn't like. Awhile back SSSal and I spent an entire year making foods we'd always hated. No we're not masochists. We wanted to know, was it the food or was it the way it was prepared? That's the question we were going to answer. We made a list and prepared everything twice, it was a very interesting year. First of all, I now love Osso Buco. Prior to learning to make it myself I always just assumed that braising meant, "to make meat wet and stringy", now I know better. Second, risotto is exquisite when made correctly but worthless when made poorly. Al dente is a fine line, too raw and it's a teeth cracking mess, overcooked and it's wallpaper paste. Third, I just detest eggplant. Please don't bother sending me recipes; it's just vile. You simply can't prepare it in any way that is remotely palatable. I tried, no more. There were some nice surprises during that year. One of the bigger shocks was fennel. I always hated the taste of licorice, I found it just too overpowering. But fresh fennel was a revelation. Fennel has a satisfying crunch with only the faintest hint of anise. It's really a very subtle vegetable. 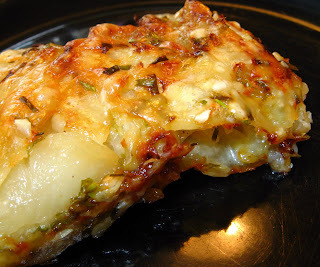 So today I'm giving you a potato & fennel gratin recipe. Well I'm not actually giving it to you, an internet cohort of mine, "Kitchen Goddess", provides the following recipe. It's very straightforward and results in a great accompaniment to any grilled meat. I've made only two changes. First, I went with a higher fennel to potato ratio. Second, I baked it in my new best friend, The Baker's Edge Brownie Pan, (see the amazon button to the left?, after you're done here, hit the link and buy one). 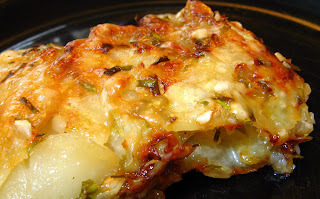 The added crispy edges had the gratin gone in one sitting. Enjoy. In a large pan, melt the butter and saute the fennel until lightly golden. Add the potatoes to the fennel and toss to coat evenly with butter. Add the vermouth and simmer until evaporated. Add the milk and cream. Salt and Pepper to taste. Cook for 1 minute. Add the chives and parsley and mix well. Transfer the mixture to the prepared pan. Scatter cheese on top. Bake for 40 - 50 minutes until top is golden brown (well maybe a little longer, because I really like it crispy). There you have it. Now, note well, I calculated all the conversions from metric. This is very dangerous mathematically speaking, but I'm pretty sure I got close. 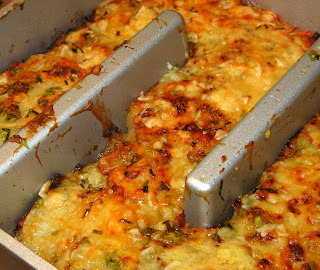 The result is a crispy, crunchy side dish that everyone loved, with only a faint hint of anise. If you're skittish about fennel go back to the original proportions of 1 fennel bulb to 4 potatoes. Regardless of the ratio, you will be very happy with the result. OK Crablings, I'm out of here. Next time another "bring along" summer salad. Until then, remember, you can do it, you can cook. Oh, by the way, besides eggplant, I really, really hate lima beans. Oh my CC that looks so good. You're right about the fennel flavour too - I hate licorice too, but I love fennel, so sweet and slightly (but only ever so slightly) anise. I can't get over how good that brownie pan looks though, I'm going to have to hunt one out. The fennel-potatoe, always like a Dan Quail reference, yes, I know both are misspelled, is a wonderful match with red wines from the South of France and/or North of Spain. Easy to find Cotes du Rhone and Rioja from Spain would be yummy with this Mediterranean comfort food. I adore fennel though hubbie hates it so I don't cook it too often. Usually I braise or roast - this sounds ab. fab. and I think I need to try this version soon!